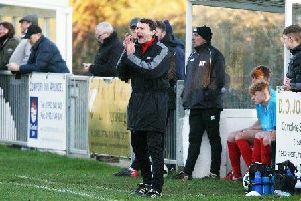 LITTLEHAMPTON Football Club player-boss George Gaskin is targeting a run in this season’s FA Vase. Golds host Wessex League Division 1 side Tadley Calleva in the first round proper on Saturday. Although Tadley are a division lower than Golds, Gaskin is expecting a tough test for his side and said: “They have won five games in a row, as have we. “I don’t know too much about them but it will be a tough game for us. With the competition only for teams from steps five to seven of The FA National League System, Gaskin feels it offers a great chance for teams like Littlehampton. He said: “This competition gives clubs like ours a real chance to progress through a couple of rounds. “We will be taking this very seriously, as we always do. “It’s important we keep that winning run going, whether it be in the league or cup.